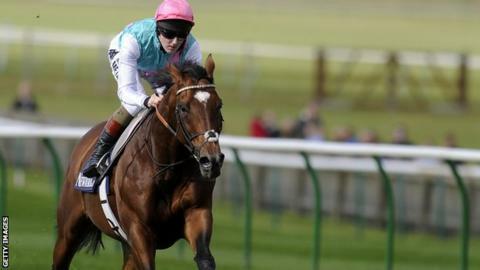 Frankel warmed up for the expected final race of his career with a workout before racing at Newmarket on Saturday. Sir Henry Cecil's four-year-old, officially the best racehorse in the world, is due to end his glittering career in the Champion Stakes at Ascot on 20 October. Winner of all his 13 races, Frankel was paraded in the paddock and then galloped over nine furlongs. Cecil said: "He had a nice blow - that was exactly what we wanted." And jockey Tom Queally said: "He felt fine. That's exactly what we were looking for as there's still a bit [of time] to go." Connections decided to recreate race conditions by parading him in the paddock, while Queally was wearing owner Prince Khalid Abdullah's silks. He was accompanied in the gallop an hour before the start of the Cambridgeshire Day card by stable companions Specific Gravity and his half-brother Bullet Train. Frankel's popularity has reached such heights there were barely any vantage points left in the paddock before the exercise. And as he went past the winning post at the end of the gallop, the big crowd gave him a generous round of applause. The horse is expected to be retired after the Ascot race and go to stud for a breeding career. When asked if Ascot would be his final start, Cecil said: "I would think so, but the prince will make that decision." Abdullah's racing manager Teddy Grimthorpe said: "It's amazing how many people came to see him. "He's done something today to keep him up to speed and he's achieved it with the minimum of fuss. "It was kind of Newmarket to allow us to come and Frankel has enjoyed himself."